Bottled by the Wordsworth Avenue Vineyards. A blend of the Bob & Rita grape varieties. 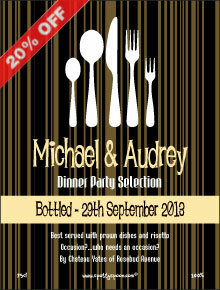 Going to a dinner party or having a few friends around for a meal, why not make the wine to perfectly suit the food. 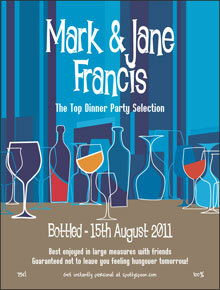 Order your own personalised wine bottle labels to create an inexpensive special touch to the dinner or supper. It is also ideal for a barbeque, buffet or simply nibbles. 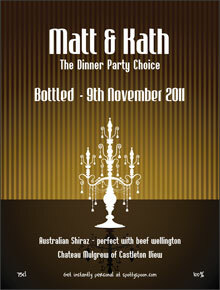 You can have your name on the wine and make it match the courses exactly. Add phrases to complement the food eg. 'Best served with French Onion soup', 'Perfectly complements Chicken Tikka Masala', 'The ideal match for Lemon Cheesecake' etc.